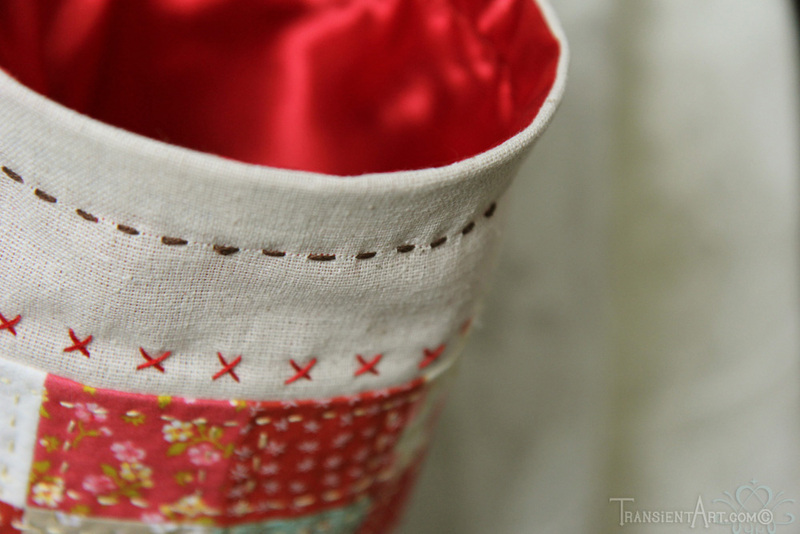 Since I got my sewing machine I've been adding basic things to my sewing stash over the year. Since then, I've been using a canning lid to hold my trimmed threads, scraps, and bits... ^^; It doesn't hold enough and has been knocked over by my boys a couple of times. I learned about the thread catchers that hang off of one's sewing table, it seemed promising. After scouring around a little, I used a tutorial from Merriment Design and changed a couple parts to suit me. I started off by cutting out little 2x2" squares of different fabrics to make a patchwork that would be paired with canvas on the top and bottom. I took my time with the embroidery over the next couple of days during free time. I added a yellow running stitch and made up some little pictures for some of the blank squares. I recycled a Cool Whip plastic container for the hoop on the inside of the catcher so that it would have a wide opening for quick thread disposal. For the lining I thought it best to use a slippery fabric so that the little threads would be more likely to fall to the bottom and not stick to the sides. I didn't want to go to the store and then remembered I had some silky fabric leftover from the capes I made for my boys: yellow, purple, orange, and red.Perfect! I like when I can versatility, even if it's just a little, having an option is better than none for me. This goes to follow that in the tutorial it shows how to have the pin cushion attached to the catcher, which is great, but I had a modification in my mind. I wanted to be able to use different pin cushions or even take the thread catcher off and keep it near me while hand sewing and not have the extras attached to it. I added some buttons to some extra fabric to help remedy this. 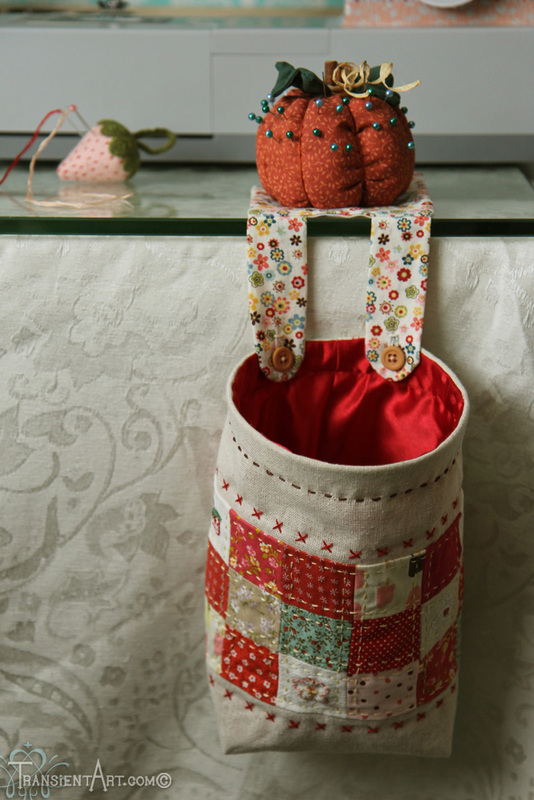 The weight of the pumpkin pin cushion is more than enough to hold the catcher, even when it's jam packed with thread and fabric scraps! *It's been quite a few months since I first made my thread catcher, and it's held up extremely well for me and been fantastic to use! I'm glad I took the time to put the slippery lining on the inside.